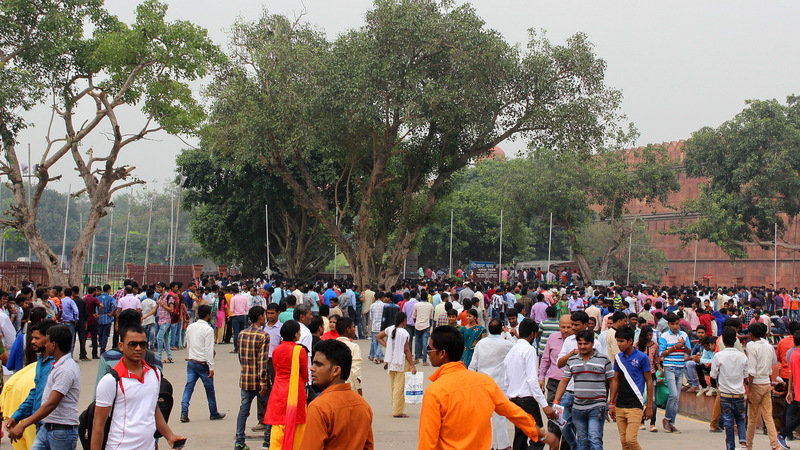 Indian crowd near Red Fort, Delhi. India is a perfect country for backpackers: it is exotic, beautiful and diverse. At the same time, India can be a very challenging destination that may quickly wear you down. Here are a few survival tips for India to make your stay more enjoyable. Handling India is not about getting the upper hand against country. Don’t even try it, because you just cannot beat India. After a while, you will eventually be scammed and India will get the best of you. No, surviving India is not about avoiding hits altogether – it’s about making the mental blows as mild as possible. I recently spent five weeks in the country. This is what I learned. Many travelers experience a culture shock when they arrive in India for the first time. The cities are crowded, noisy and dirty. If you come from a rich Western country, you’ll quickly see a level of poverty that might have been completely foreign to you. Even things you’ve taken for granted might be missing. Therefore, the first survival tip is this: set your expectations on the right level and accept the conditions. You cannot change the daredevilish traffic culture or stop people from urinating in the public, so just try to adapt to the situation. You can still put your trash in the bins instead of throwing it in the streets if you want to, but don’t expect every local to do the same. India is like a continent of its own – there are so many places to see that you just cannot fit them all in one trip. Instead, try to pick a few places where you spend more time. Also, if you try to experience too much in India, you’ll start to feel travel fatigue very quickly. The sensory overload of all the sounds, sights and smells will hit you if you don’t take your time. At the beginning of my journey through India, I tried to save time by using night trains and sleeper buses. I quickly realized that they’re not for me. While I could cover long distances at night, I didn’t sleep well and I spent a few days mostly just recovering from sleep deprivation and health issues that followed the overnight journeys. Thus, when I finally left India, I spent three days on my journey from New Delhi to the border of Nepal. I could have done the same with just one long trip on a night train and a switch to a bus at the last stop, but I just didn’t feel like it. Instead, I covered the distance by traveling six hours a day on average. This way, my pace that didn’t feel too rushed and I could sleep in (mostly) comfortable hotel rooms every night. 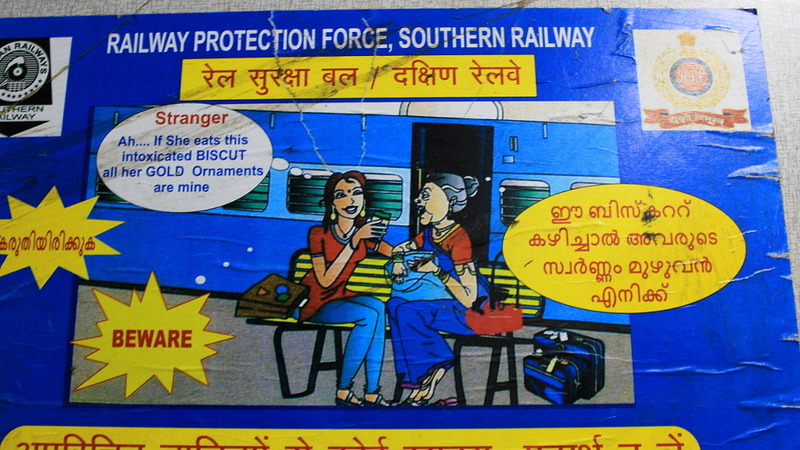 A sign warning about “intoxicated BISCUTS” on a train in India. Unfortunately, scams and lesser white lies are extremely common in touristy areas of India. The scams often work because they rely on our friendliness: as human beings, we want to believe in the goodness of others. I’m not saying that you should turn your heart into stone and doubt everyone, but it’s good to be careful to a certain degree. I also recommend that you learn about the scams beforehand. I found the Lonely Planet India travel guide very useful for this, because it warns about many of the most common deceits. For example, when you try to enter the New Delhi railway station to buy a ticket, it’s not rare that people pretending to be railway officials will try to block your entry, directing you to an “official” ticket office around the corner. Besides counting on your benevolence, there’s another aspect that helps sell the scams: The hoaxes are often so shameless that you just can’t believe someone would really pull them off! It’s just hard to comprehend how a dishonest rickshaw driver can lie so casually to tourists every day to make a living. But it’s better to believe it, because it really happens. After witnessing too many scams and hoaxes, you may want to completely block yourself from the outside world. It’s important to remember that not all Indian people talk to you just to benefit from you. The locals are often very excited about meeting a foreigner and are they sincerely want to help you out. There were numerous times when I was given a seat in a crammed train or when the locals I just met went to great lengths to make sure I had everything I need. Still, there are things about Indian communication that you should be aware of. One important difference is that because the locals don’t want to let you down, they will often answer all your inquiries – even if they really don’t know the answers. This can be a bit difficult, when you really want to find the correct route to your hotel or the departure time of a bus, but you can’t be sure if you’ve been given the correct information or not. Do a bit more research and ask a few other people if you’re left in doubt. India won’t ask you if you want to get out of your comfort zone. Instead, it will throw you to the deep end of the pool without any hesitation. While you have to adapt to a more limited personal space and other cultural differences, it’s still acceptable to show your limits. Many of the tourist workers are experts of persuasion and psychology, so they can make refusing very difficult. Still, you should not agree to something that you don’t want. Some of the locals might also want things from you that you don’t want to offer. I’ve had people in trains and buses ask me to arrange them a wife or a job in Finland, demanding explanations when I wouldn’t want to help them. Keeping strict limits is also important when it comes to body contact – especially if you’re a woman. Sadly, all kinds of harassing and touching of Western tourists are way too common in India. Even I had to experience it, and I’m a guy! Some of those who do it know it’s wrong, but they can’t resist the temptation. Then there are others who mistake a friendly smile and eye contact for flirting – which, of course, still doesn’t make it acceptable. India is full of people. This will become very apparent to you when you get on a crammed second class carriage of a train for the first time. While there are smaller towns and quieter hours, it’s almost impossible to avoid the queues completely. This makes your personal space smaller and the waiting hours longer. Try to take the overcrowding into account when you plan your schedule. While a cable car ride on a hilltop near Pushkar, Rajashtan might take just five minutes, waiting in the line can last hours. And reaching the outskirts of the city on a bus doesn’t mean that you’ll soon arrive in your destination. For example, my bus from Jaipur to Delhi arrived two hours behind schedule after we spent the last three hours of the journey in the traffic jams of the capital. Back home, you can usually count that you have a steady and fast internet connection whenever you need it. Well, this is not necessarily the case in India, where the Wi-Fi connections tend to be slow and unstable. Because of this, you shouldn’t leave any important things you do online for the last minute. 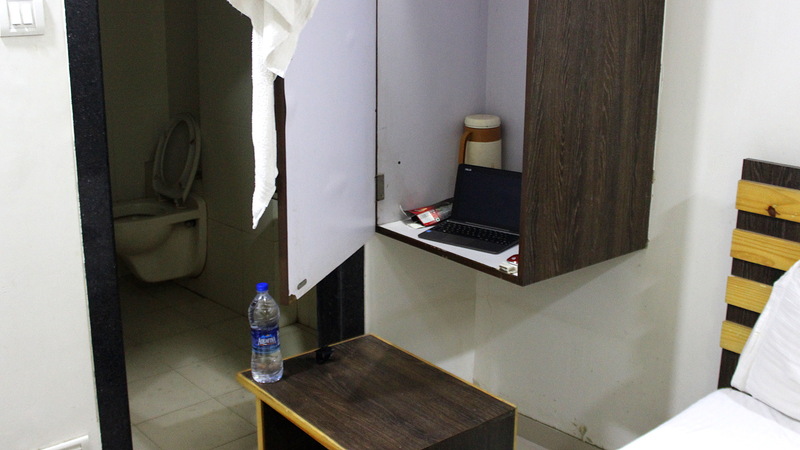 There were many occasions when I couldn’t reserve my next accommodation, because the internet connection of my guesthouse stopped working completely during the last evening of my stay. If I had done the reservations sooner, the lack of online access on the last day wouldn’t have been such a big issue. I visited India during the Monsoon season. During my stay, the rainfall wasn’t nearly as bad as I had feared – the rain showers were usually short and the warm weather made them more tolerable. Instead of dressing up, it was actually better to wear less, so I had fewer clothes to soak. Sandals were better than shoes and socks, and shorts better than pants. 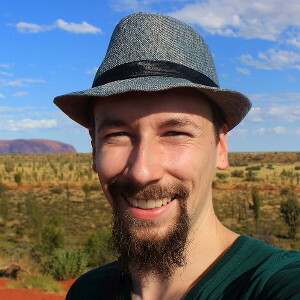 I had more problems with the sun, because I often forgot to apply sun lotion during the cloudy weather – only to have the sky open up and burn my pale Nordic skin. Insects can also cause trouble. I only used my mosquito net a few times, but it always guaranteed a better sleep. When the mosquitoes were an issue, I preferred long sleeves and covering clothes. If the bites irritate you as much as they irritate me, I very, very strongly recommend that you buy something to calm the insect bites. I enjoyed India. I met absolutely wonderful people during my stay and I can understand why some travelers return to the country every year. Still, I can’t deny the intensity of the experience. Sometimes, I felt like I experienced the highest and lowest points of my round-the-world trip in India – and just during one day. On the other hand, do you even want your trip to go completely as planned? I don’t, and I believe that many backpackers agree with me. A totally unsurprising trip would be dull and disappointing. The fondest memories are born when things are out your of control – and that’s something that India can definitely offer! Great article! I wish I’d read this before embarking to Delhi. That city is a lesson in patience!